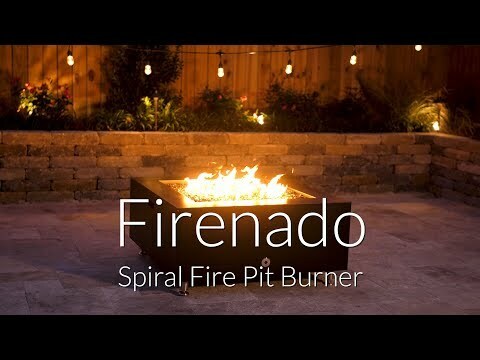 Add a full, more natural looking flame to your fire pit with this Firenado exclusive! This Firenado 24-Inch Flat Round Stainless Fire Pit Burner Pan is perfect to simplify the construction of an impressive outdoor gas fire pit. Constructed of 16-gauge, 304 grade stainless steel, this fire pit burner pan is made to endure years of use. The Firenado 18-inch spiral ring burner is designed to provide greater flame coverage than a regular ring burner. The multiple burner tubes put flames where no other burner is able, giving you a stunning appearance, and better heat coverage. The natural gas spiral ring burner offers up to 147,000 BTUs of heating power, and must be used outdoors in a well-ventilated area. This burner has a 1/2-inch gas inlet. Firenado warrants stainless steel burners and burner pans to be free from defects in materials and workmanship, for a period of ten (10) years from the date of purchase, by the original purchaser.